Robert C. Wingert, Jr., 65, died suddenly at home on Thursday, April 21, 2016. Robert was born in Chambersburg, PA on May 8, 1950, the son of the late Robert C. and Arleen (Spangler) Wingert, Sr. He was a graduate of Shippensburg University where he earned his undergraduate and master’s degree. Robert served as a special education teacher with the Lincoln Intermediate Unit #12 for 40 years. He passed his guide examination process and earned a place a Licensed Battlefield Guide in Gettysburg in May, 2000. He was awarded Badge # 168. 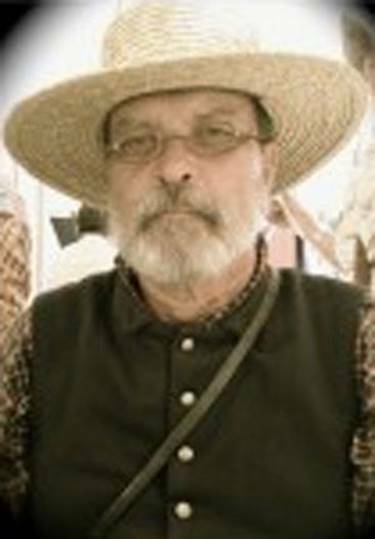 An avid war-buff Rob was a member of the 61st Pennsylvania reenactment unit for many years, and enjoyed War Gaming. Upon his retirement from teaching he was looking forward to a long career as a full time guide. Robert is survived by his wife, Mary E. (Pauley) Wingert; two sons, Nathan R. Wingert and his wife, Michelle of Lancaster, PA and Adam C. Wingert and wife, Molly of Chambersburg; two daughters, Tammy Van Wingerden and husband, Andy of Virginia, and Nicole Sullivan of Chambersburg; his sister, Susan Wingert of Chambersburg; and 14 grandchildren, Aidan, Brady, Jack, Nolan, Eve, Milan, Natalia, Bella, Willow, Philip, Abigail, Joshua, Emily, and Caleb. Funeral services were held at 11 a.m. on Tuesday, April 26, 2016, at the 1st Baptist Church, 1015 Chambersburg Road, Gettysburg, with the Rev. Carl Harris officiating. Burial was in the Evergreen Cemetery in Gettysburg. Memorials can be made to the Association of Licensed Battlefield Guide, 241 Steinwehr Ave., Gettysburg, PA l7325. Online tributes and condolences can be made at monahanfuneralhome.com.